Delicious mashed, baked and fried. 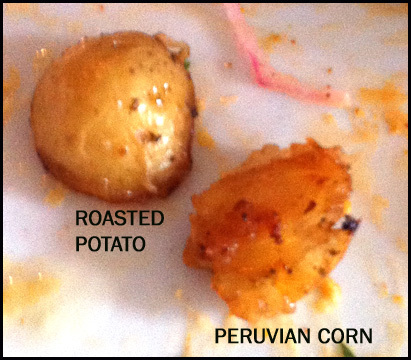 Since Peru is the home of the potato and a South American country, I expected the yummy tubers and chilies (called aji in Peru) to play prominently in its cuisine and they did in the meal we had at Chicha. Since I was not familiar with Peruvian cuisine, I went to Wikipedia to do some reading and all information about the cuisine offered in this post was found here (http://en.wikipedia.org/wiki/Peruvian_cuisine). Gathering a few friends, we headed to Chicha for a weekday dinner. We kicked off our meal with a round of after work cocktails of Pisco Sours and some work related venting. I’ve had Peruvian Pisco Sours before and was looking forward to this drink. Unfortunately due to the province’s liquor board rules, you can only get Chilean Pisco and not Peruvian version. The cocktail was fine but it didn’t quite match the memories of the Peruvian Pisco Sours I’ve had in the past (less fragrant). 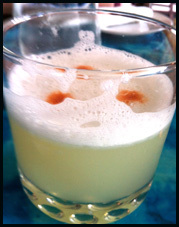 Actually does anyone know why Peruvian Pisco is not allowed in BC? In terms of the food, we tried 2 causa dishes, 2 types of skewers, an order of empanadas, seafood cebiche (no that’s not a typo – that’s how they spell it in Peru), a vegetable fritter and picarones for dessert. Causa is a cold whipped potato dish that is mixed with chilies, oil and key lime. We tried the Amarillio and Cilantro options. The amarillio is a mild pepper native to Peru and it turned the potato mixture a light golden yellow. It was topped with a crab salad and pea shoots. The cilantro obviously turned the causa green and a chopped tuna tataki mixture sat above the column of green potatoes. Between the two, the yellow causa was the favourite. The sweet, mild flavour and soft texture of the crab worked really well with the amarillio infused mash. In contrast, despite being bright green you couldn’t really taste cilantro in the green causa. The tuna was prepared well but its strong flavours overwhelmed the green mash. For the 2 skewers we got the chicken and the octopus + chorizo. The grilled morsels of white chicken meat came with roasted potatoes, kernels of Peruvian corn and amarillio pepper sauce. A Peruvian black olive aioli and basil and chili mash came with the skewers of octopus and chorizo. The octopus skewer was better executed as we thought the chicken was a bit dry. However, with the exception of the chorizo, both meats we under seasoned and relied on the sauces that came with the dish for flavour. Although the skewer themselves were average, our group really like the sides that came with grilled meat on a stick, especially the delicious basil & chili mash and the Peruvian corn which was starchy instead of being sweet. We would have been a happy bunch if they just served us a bowl of the basil mash topped with Peruvian corn. 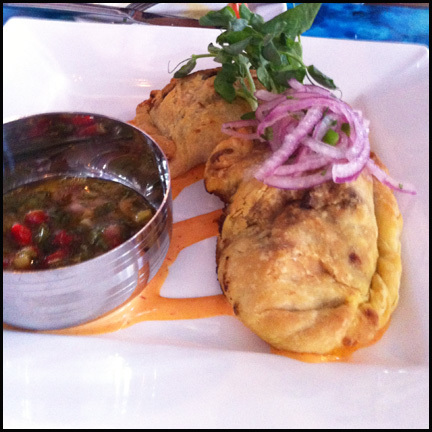 The empanadas filled with an aji chicken stew were another dish our table liked. The pastry was flaky and buttery. The stew was well seasoned. It was a great package of food. 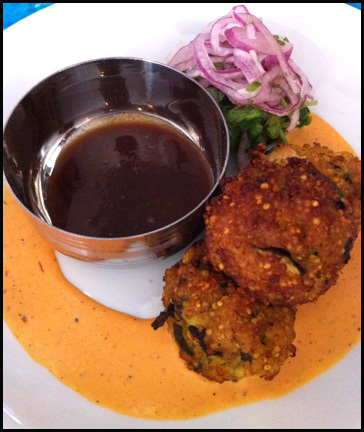 The vegetable fritters made with quinoa, cauliflower, spinach, zucchini and corn had a crispy exterior. The quinoa gave the mixture a crunchy texture but overall due to the ingredients involved, it was very mild tasting. The passion fruit sauce was needed to amp up the flavour. I personally didn’t like the seafood cebiche which contained octopus, mussels, shrimp and fish. I felt the acid they used overwhelmed the entire dish with tartness. Last but not the least, the favorite dish of the night was the Picarones. They are essentially donuts made with pumpkin and sweet potato. 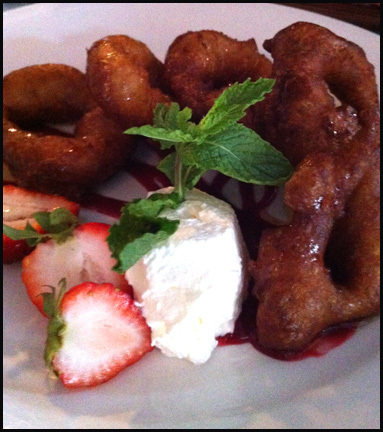 These tasty donuts were served with a spiced honey and pisco raspberry sauce. These circular desserts were amazing. They had an understated sweetness with an unique soft texture like a semi solid goo. I know that doesn’t appetizing but if our group wasn’t already stuffed, we would have ordered another plate of Picarones. I’m not a dessert person but if I were in the Mount Pleasant area, I would head straight to Chicha for their donuts even after a meal from another restaurant. In fact I think noodles from Congee Noodle House and then Chicha’s picarones for dessert wouldn’t be a bad idea. Overall, I would definitely return to Chicha. I found the food to be appetizing due to the vibrant colour of the food which was light but substantial. Chicha’s food is perfect fare for the warm summer nights of Vancouver.